The agriculture sector in Sri Lanka employs 31.3% of the total labor force of the country, but its contribution to the Gross Domestic Production (GDP) is just 11.9% (Central Bank of Sri Lanka). So, basically one third of the labor force is utilized to produce the just over ten percent of the GDP. This is just one side of the issue, but when we consider other issues related to this, such as large amount of government’s money spent on agriculture as subsidies (fertilizer subsidies, etc.) which can be invested on some other sector for better results, continuous poverty of rural people who are engaged in agriculture, etc. - it is clear that we have a issue of productivity within the agriculture sector and we need to address it immediately. There are many factors (policy, legal framework, technology, knowledge, markets, research, etc.) to be considered while trying to improve the productivity of agriculture, but in all of them the Information and Communication Technology (ICT) can definitely play a role of a catalyst. Fortunately this has been understood, by the various stakeholders in the agriculture sector and as a result we can see many initiatives under the theme of ICT4 Agriculture today in Sri Lanka. As an attempt to bring all those different initiatives to one platform, Prof. Mangala De Zoysa (University of Ruhuna, Sri Lanka) and some other likeminded people have organized the Sri Lanka’s first ever ICT4 Agriculture Conference (http://www.itfac.mrt.ac.lk/conference/), which is really a need of the hour. Yep we need to help to mother lanka. we need more site like this and the following. Chinese telecom operator China Mobile has signed a strategic framework agreement with China's Ministry of Agriculture for jointly promoting digital information development in China's rural areas. Under the agreement, China Mobile will invest CNY70 billion in the next three years in basic communication network and information projects in these areas. The two parties reached cooperation in five other areas, including agricultural industrialization; information services for agricultural production and management; construction of rural information service stations; information technology applications in modern agricultural demonstration areas; and construction of a agricultural production scheduling system. According to Wang Jianzhou, chairman of China Mobile, the company plans to add over 10,000 natural villages to its network coverage every year and over 98% of China's rural areas will be covered at the end of this three-year plan. Can a mouse-click fetch profit to farmers? GTech (Group of Technopark companies) is bringing farming and ICT brains together this week to come out with a workable answer to this question. Technopark in the capital of Kerala is hosting a conference on 'Information and Communication Technolgies in Agriculture' on January 22. National Bank for Agriculture and Rural Development (Nabard) and Kerala IT Mission will also partner GTech in organising the meet. S Rama Rao, president, GTech, said that ICT in agriculture sector is of special significance and plays a vital role in transformations relating to delivery of services as well as in the marketing of agricultural products. The conference aims to examine several ongoing projects that aim to provide IT-based services for specific domains like agricultural marketing, agricultural production and extension services. The Indian Institute of Information Technology and Management in Kerala (IIITMK) is the knowledge partner for the conference. There will be three sessions dedicated to the use of ICT in agriculture marketing, production and extensions services. According to Satish Babu, secretary, GTech, the conference would focus on showcasing successful case-studies in innovations in the agriculture sector. The deliberations would be also utilised to give effective linkages to development organisations in farm sector. 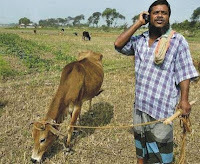 Like the Rajasthan government's ICT delivery service Jan Mira or Gujarat's GAU-SAT-KRU or Madhya Pradesh government's Gyandoot or Maharashtra government's Maha-Agrinet or Andhra Pradesh government's Rural e-Seva, Kerala government runs Kissan Kerala and Akshaya Kendras. I am not sure what you are referring to, original post or the comment by “India”. I can confirm the accuracy of the post. After a long years of civil war, it is encouraging to see Sri Lank striving to improve in every field especially in agriculture. No doubt that there are hurdles in the process, but, there is also hope and scope for improvement. I am glad to see some serious business in agriculture to improve meaningfully. I also believe that the Information and Communication Technology (ICT) can definitely play a role of a catalyst in this regard. There is little doubt about the fact that information and Communication Technology (ICT) can definitely play a role of a catalyst for agriculture in sri lanka. It is wise to adopt this potential catalyst for development. Food security is one of the most important concerns of any government, especially in the third world countries. There is little doubt that a stable agricultural industry ensures a country of food security. Intrestingly, the Information and Communication Technology can definitely play a role of a catalyst in Sri Lankan agriculture. It is heartening to note that the issue of productivity within the agriculture sector has been recognized and this need to be addressed immediately. Thanks for report.